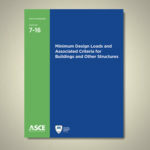 The first update to ASCE 7 in six years, ASCE 7-16, Minimum Design Loads and Associated Criteria for Buildings and Other Structures, took a step closer to adoption as an International Code Council reference standard, Wednesday. ICC governmental members voted 65-40 in support of ASCE’s signature standard during public comment hearings, Oct. 19, at the ICC Annual Conference in Kansas City. Adoption of ASCE 7-16 will now go to an online vote among ICC governmental members by electronic ballot in November. If approved, 7-16 will be included as a reference standard in the 2018 International Building Code, which is adopted nationally as state and local jurisdiction building code, as well as in the 2018 editions of the International Residential Code and International Existing Building Code. ASCE 7-16 Chair Ron Hamburger, S.E., P.E., SECB, F.SEI, urged ASCE members to reach out to ICC governmental members – typically building officials or fire marshals – in support of ASCE 7-16. ASCE 7-16 features several important updates from the 2010 edition, including new wind speed maps that result in reduced wind speeds for much of the country and clarification of the special wind study zones; new regional snow data generated by state structural engineer associations in Colorado, Oregon, New Hampshire, and Washington and other mountainous states; and an entirely new chapter with tsunami design provisions. The National Association of Home Builders organized opposition to the standard, resulting in its inclusion in Wednesday’s public hearing. NAHB and other roofing trade organizations objected to updates in the wind chapter, including provisions for hurricane-prone regions in the southeast that increase corner pressures on flat roofs within 600 feet of the coast. Support for ASCE 7-16 during ICC’s hearing came from a broad range of professionals across many industries who were involved in the development of the consensus standard. “ASCE was able to build a great coalition of industry organizations to testify on our behalf including AIA [American Institute of Architects], ACI [American Concrete Institute], BSSC [Building Seismic Safety Council], FEMA [Federal Emergency Management Agency], IBHS [Insurance Institute for Business and Home Safety], NCSEA [National Council of Structural Engineers Association], MBMA [Metal Building Manufacturers Association], and WABO [Washington Association of Building Officials].” Hamburger said. Learn more about ICC’s process for its November vote, and encourage local building officials or fire marshals who may be ICC governmental members to approve ASCE 7-16.